In 2007 Renny Richardson embarked on a quest to find out more about his family’s contribution to the First World War; little did he know that this would lead him on a journey of discovery not only into his family’s connection with Crawley in Sussex, but also into how the war impacted on the whole town. This book is a result of his journey. Three members of the Cook family served; one, Second Lieutenant Richard Cook, was killed in 1918. 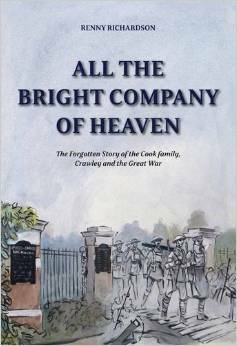 Part one of the book looks at the Cook family and their links to the area. As a prominent local family of builders, they are mentioned regularly in the local newspapers. Part two goes on to the war years, the narrative combining the stories of the Cook family’s war service with those of other locals who served. Richard Cook was killed during the Battle of the Lys in April 1918 – aged just 20 – and naturally a proportion of the text examines the movements and actions of his battalion (11th Suffolks). Part three looks at local memorials, giving the background behind them. This was particularly interesting reading to me given the lack of records concerning my local memorial, and gives an insight into the wranglings that surrounded the commemoration of the war. For example the local paper recounts discussions of whether a memorial should be commemorative or should celebrate the victory of the war; and whether remembrance should be enshrined in a physical memorial or a more practical legacy such as a library. Part four wraps up the book with the ‘end’ of the author’s journey, with reflections on the family legacy, the war, and his research. Richardson had two big advantages when compiling this book; more than one local newspaper reported in great detail on the war, including those local men who fought and died, and secondly his family were very well known in the area and hence received a lot of column inches. These details are reproduced with extra contextual information added by the author, including details of local soldiers’ deaths, commemoration, and local connection. From personal experience I know that trawling though old newspapers is no easy task, and the book is testament to the thorough research of Richardson is transcribing these old reports and turning them into a narrative of how the war impacted the local community. Naturally this genre of book mainly appeals to people with a connection to the area or someone from the area who died, but on a broader level the book is an excellent example of how personal research can develop into something wider, and how a variety of sources can be used to tell the story of the impact of the war on a community.